Most butchers can order you a whole rabbit if they don't have one on hand. They will also probably cut it into serving-size pieces for you, which will turn this braised rabbit recipe into a dish that's very easy to make. Braising is a great way to prepare a rabbit recipe since it helps keep the meat moist and flavorful. Season the rabbit pieces generously with salt and fresh ground black pepper. In a large Dutch oven or other heavy pot, heat the olive oil over medium-high heat. When the oil is hot, brown the rabbit well on all sides, in batches, if necessary. Reserve the browned rabbit and add the onions, celery, garlic and 1 teaspoon salt. Reduce the heat to medium and saute for 2 to 3 minutes. Add the vinegar and wine and stir to scrape any browned bits from the bottom. Boil the wine mixture for 2 minutes; then add the tomato, chicken broth, rosemary, thyme, and oregano. Put the rabbit back in the pot and stir to combine. Turn off the heat, cover tightly and place the pot into a preheated 350 F oven for 1 to 1 1/2 hours, or until the rabbit is fork tender. Remove and stir in the fresh parsley. Taste the broth for salt and pepper and adjust as needed. Allow to rest, covered, for 20 minutes before serving. Serve the rabbit topped with the remaining braising liquid and vegetables. 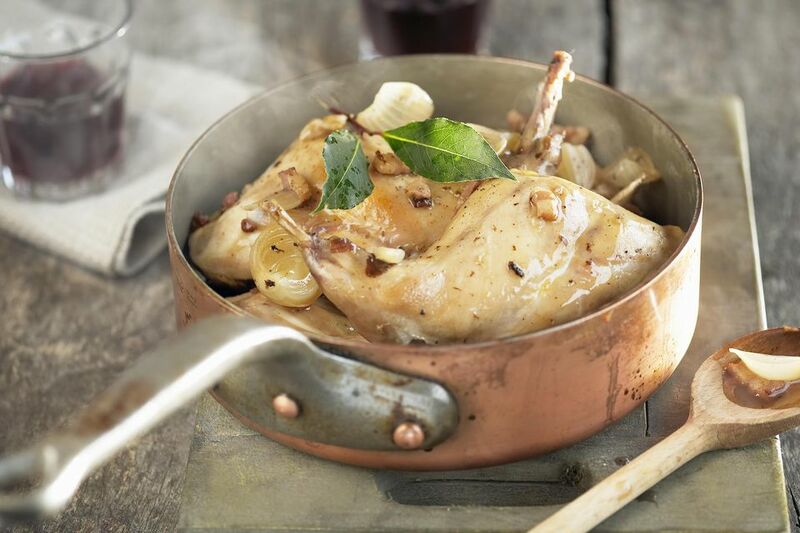 Rabbit is similar to the light taste of chicken, so let that be your guide when choosing what to serve with this dish. Rice pilaf, basmati rice with sauteed onions and mushrooms or risotto would all be good partners for this dish. For a vegetable, fresh green beans or a green salad, and soft Italian bread is a must-have. Good wine pairings are mostly dry whites: chardonnay, pinot grigio, sauvignon blanc or Orvieto. Since rabbit is somewhat gamey even if mild, and if you like red wine, go for it. But stay in the light range with pinot noir, Gamay Beaujolais, grenache, cabernet franc or Cotes du Rhone.